In Thailand, ordering a fried egg (Kai Dow) on top of your spicy-hot one-dish meal is about as ordinary as when you order french fries with your cheeseburger. The two just go together so well. We know that you might think it kind of weird that we want to show you how to fry an egg, because everybody knows how to fry an egg, right? But in Thailand we are very particular about our everyday foods, and Kai Dow is no exception. 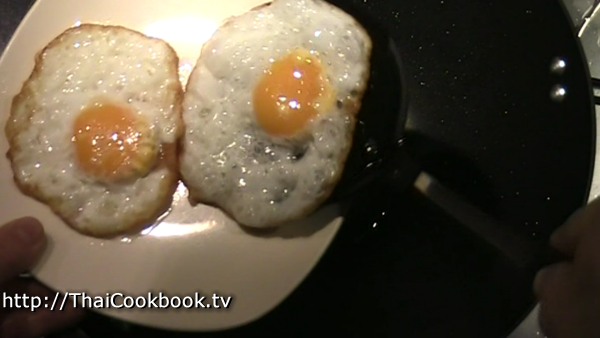 If you are ever lucky enough to fry an egg for a Thai friend, watch this video first for some easy to learn tips. What's in our Fried Egg over Rice. How we make our Fried Egg over Rice. 1) Heat 1/2 cup of oil in a deep frying pan. 2) Add the egg and fry on one side for about a minute. 3) Avoid splashing hot oil over the egg so it stays bright yellow. 4) Cook until the edges and bottom are golden brown and crispy. 5) Serve over hot steamed rice, with cucumber and chili fish sauce. 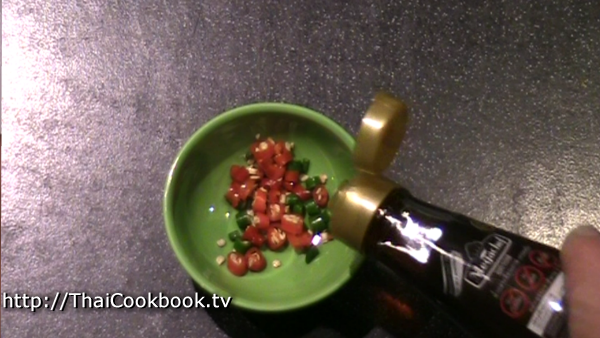 Heat oil in a large wok or frying pan, over medium to high heat. Add one egg. Let the egg float on the deep oil. Move it around to prevent sticking. Fry the egg on one side only for about 2 minutes, letting it get golden brown on the bottom. Avoid splashing hot oil over the top of the egg so the yolk remains bright yellow and uncooked. The finished egg should have crispy brown edges, be well browned on the bottom, but on top it will resemble a "sunny-side up" fried egg. 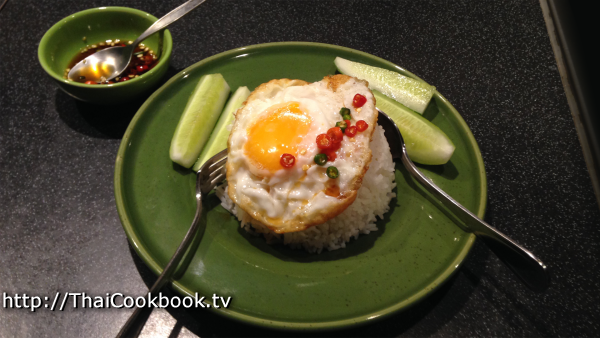 This is the most common way eggs are prepared in Thailand. However, some people like the egg fully cooked. In this case it is turned over and browned well on both sides. To season the egg, we will use a little fish sauce with some hot chili added. We call this Prik Nam Blah, and it is probably one of the most common condiments found at a Thai dinner table. Just cut a couple of Thai hot chilies into thin slices and add fish sauce. Because this Kai Dow is being served as a one-dish meal with rice, it's common to serve some fresh vegetable son the side. Here I used some cucumber wedges, but spring onions or any crisp vegetable will be nice. Some people like some fresh lime to squeeze over their fried egg. 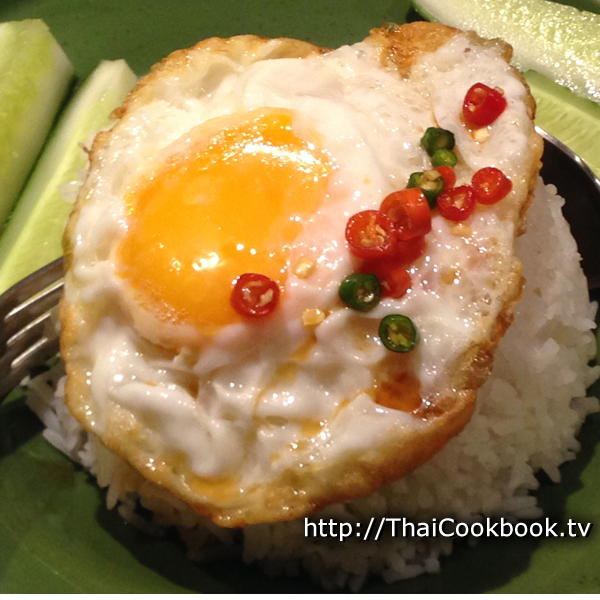 Serve the egg on top of some hot rice, and arrange the vegetables so they look nice. Enjoy with Prik Nam Blah, spicy-sweet ketchup, or other condiment.